Boy… I was almost sure I’d hit my profit target (and some!) with this trade. After all, the pair was in a solid downtrend, creating lower lows while testing support at 114.00 time and time again. Actually, that’s why I felt confident enough to hold my trade open over the weekend. Little did I know that the euro still had a bit of fight left in it. The euro zoomed up the charts to start the week as investors seemed to take their foot off the bear pedal in response to the preparations being made ahead of the Greek Parliament vote on austerity measures. Apparently, French and German governments are in talks with their banks about rolling over Greek debt, which just shows how confident they are that Greece will pass the austerity program. Naturally, this launched the euro up like a loaded spring, pushing it back up to retest last week’s high. Trade closed at breakeven: +0 pips/ +0.0%. Actually, I did attempt to take profit and close half my position when price was stalling at 114.00 early yesterday morning. But there was a big problem – my broker wouldn’t let me. Apparently, half my position didn’t meet the minimum position size that my broker requires to execute a trade (even if it means closing a portion of one). So basically, my only options then were to either close my entire position, or keep all of it open. Obviously, because I was very confident with my trade idea, I chose the latter. It’s just unfortunate that it didn’t work out in my favor. Right now, it’d be pointless to blame what could’ve, should’ve, and would’ve happened on my broker. Yeah, it’s a pity that I ended up with nothing despite coming so close to taking profit. But the truth of the matter is that these things have to be factored in when taking a trade. You just have to take these things in stride and learn from them. Anyway, thanks for following guys, and I hope you were all able to bag a few pips with this trade idea. Til next time, this is Cyclopip, signing off! After stalling at the trendline and 61.8% Fib level, EUR/JPY FINALLY shot down during the European session yesterday, as it seemed like risk aversion took over the markets. Poor euro zone PMI figures, as well as disappointing Chinese PMI data helped spurred the risk sell off. EUR/JPY dropped to as low as the 113.80 level, and I was sure that the pair was headed to test last week’s low. However, in a crazy turn of events, the pair has retraced back up and is now sitting around 114.80! Dang it! I totally didn’t expect the pair give back its gains so quickly. The pair had just dropped 150 pips on the day and I thought we wouldn’t see much movement during the rest of the U.S. session. But hey, that’s what makes the forex market what it is! I’m still bearish on this pair and I don’t quite feel like closing my position just yet. However, I can’t overlook that bullish green candlestick or how Stochastic has just crossed over out of oversold conditions. For now, I’m gonna see how the rest of the Asian session plays out and see if the market will send the pair lower. I’m moving my stop to my entry point at 115.05 to limit my risk and I’ll make a decision later today as to whether I will end up closing early or not. If I do get stopped out, no harm done! I’ll just reevaluate and consider reentering my trade if there’s another nice setup. Congrats to those of you who have bagged some pips on this trade! Nope I didn’t get the breakout signal I wanted last week, but I do think another short opportunity has emerged on EUR/JPY! Get your Fib-sticks and divergence cheat sheet ready cause this looks like one sweet setup! 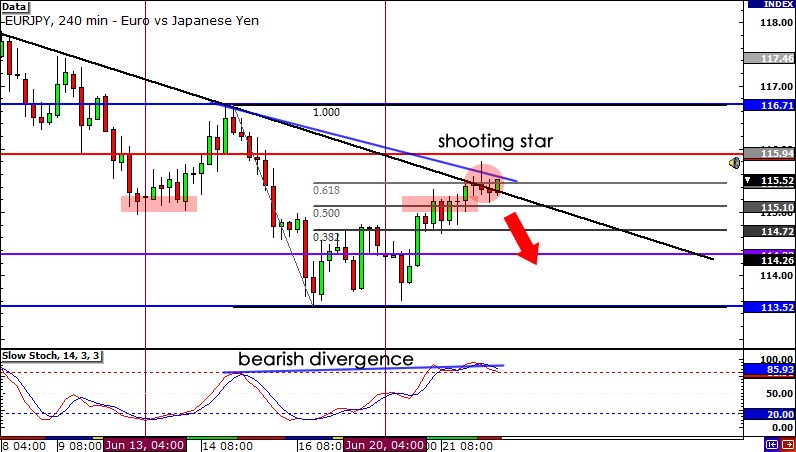 After failing to break through key support at 113.60 last week, EUR/JPY has retraced back up. The pair is currently sitting just below the 115.50. And this is where all the fun begins! First, the pair is finding resistance at a falling trend line. 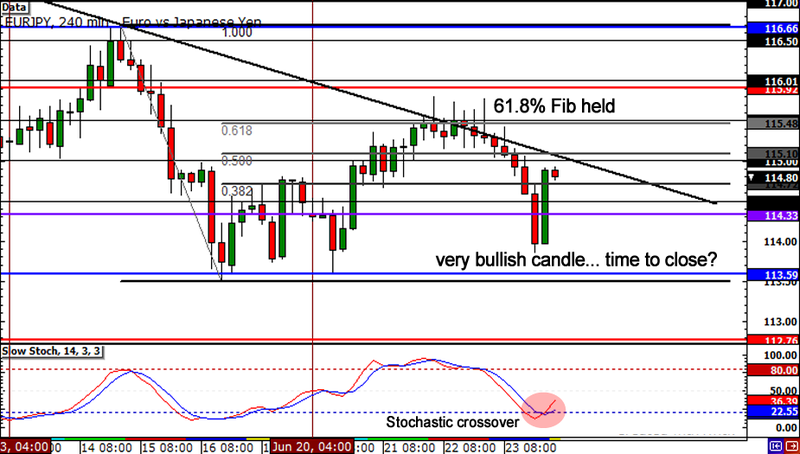 Second, it has formed a Fib-stick formation as a shooting star has formed just below the 61.8% Fibonacci level! Third, bearish divergence has formed as price has registered lower highs but Stochastic is showing higher highs! Fundamentally, the euro got a nice boost when Greek Prime Minister George Papandreou survived the confidence vote earlier today. This was good news since Greece can’t afford to have a divided government right now. Still, I can’t help but feel that the country has a long way to go. It still has to come to terms with austerity measures and I’m not quite sure how that will go down. That’s why I’m still bearish on the euro. Yesterday, I actually tweeted that I jumped in and shorted at 115.05, as it looked like the 50.0% Fib was holding. I put my stop above this week’s top WATR, at 116.30. As for my profit target, I’m waiting to see how price will react to the strong support at 113.70. If it looks like it’s holding, I’m gonna close out my position before the end of the week. However, if price breaks through support, I will look to add to my position. 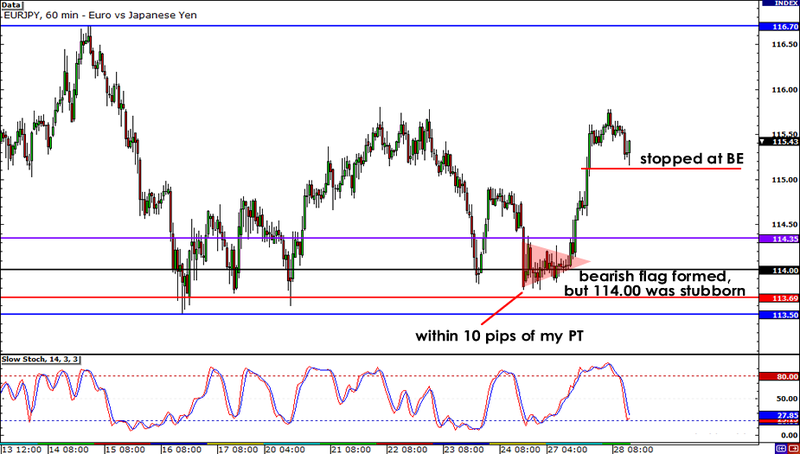 Short EUR/JPY at 115.05, stop loss at 116.30, profit target at 113.70. What do you guys think will happen? Will you join me on this trade? Hit me up with some comments on Facebook and Twitter! and let me know how you plan to trade EUR/JPY this week!